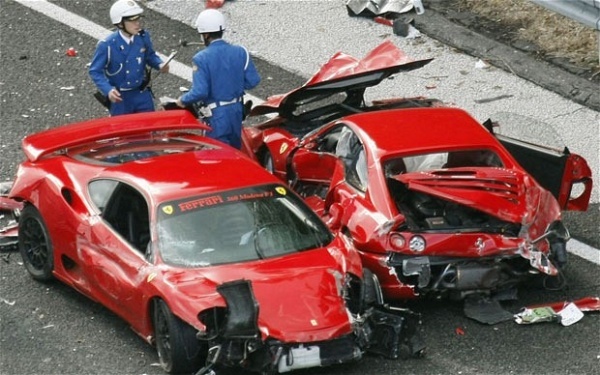 14 cars including Ferraris, Lamborghinis and Mercedes involved in crash believed to be Japan’s most expensive ever road accident that cost up to US$ 4 million. The multimillion-dollar road accident occurred on the Chugoku expressway in Shimonoseki, south-western Japan. According to the police, a pack of about 20 supercars was travelling in convoy on Sunday morning. However, the driver of one of the Ferraris tried to change lanes and hit a barrier on the rain-soaked road. The driver spun across the motorway and the other cars collided while trying to avoid hitting his car. The debris was spread over about 400 metres of the motorway. There is no official statement on the total cost of damage but some of the vehicles were beyond fix. God bless that no one was seriously injured but only some minor cuts and bruises. Check out the YouTube videos for more info.